You are having a CSI Party and you need a little something on your plain and ordinary cold cut tray. Use the PSI Picks. You could also use the PSI Picks to decorate a fruit tray, a vegetable tray, a cheese tray, or cupcakes. Each package includes 50 PSI Picks. They are made of a wooden pick with a paper flag attached. Each one measures 2½ inches. 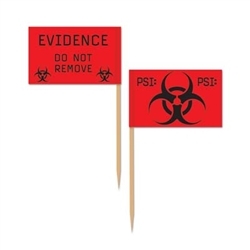 One side of the flag has EVIDENCE DO NOT REMOVE with Bio-Hazard signs, and the other side of the flag has PSI: PSI: with a large Bio-Hazard sign. Placed on my cupcakes for a crime scene table. Added a lot to my theme. these are a little smaller than I expected. However, they will still lend a nice touch for my party. These were such a cute little addition to my CSI themed party.